DIMITAR Berbatov and Loïc Rémy responded to accusations from these very pages last week that they had one eye on the beach to both notch for FC Testiculadew. The two goals, alongside a Steven Pienaar assist and John Ruddy clean sheet, put defending champions FCT to within 56 points of Sporting Lesbian. 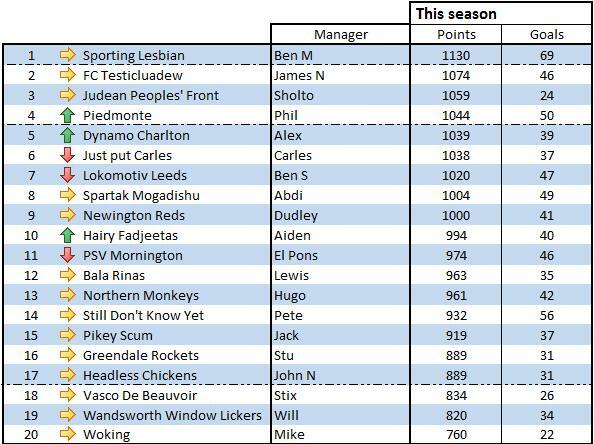 The 19th goal of the campaign from Lesbian’s £2.5m midfielder Michu puts one hand on the title for the debut manager. Another all-action display from the defence – Joe Hart, Ashley Cole and Jose Enrique have scored over 400 points between them – and a brace from Emmanuel Adebayor put the club just 15 points off second place. An excellent season from the Anders Breivik doppleganger manager whose previous league best was ninth. Goals from Oscar and Robert Snodgrass found the net. Nathan Dyer and Carlos Tevez helped others to do the same. Even Danny Graham’s drought and Per Mertesacker can’t stop the Olisadebe Euro 2012 winning manager from an outside chance of second place. The Catalan manager dropped down the table, but all eyes will be on this weekend’s Canesten Combi Cup final against Spartak Mogadishu. Goals from Silva, Henderson, Maloney & co could prompt a cup win and podium finish come Sunday. It would take a Herculean effort for Lokomotiv to make up the 39 point gap to third place. The manager doesn’t look like achieving the runner up spot debut of last season. Meanwhile at the other end, the relegation dogfight looks to have fizzled out. Even with the Lukas Podolski double scored in tonight’s match (not included in this update), Vasco De Beauvoir are closer to digging themselves further into oblivion than the other way. The end of an eight year tenure in the Kenna? Wandsworth Window Lickers are trying to guide themselves into the end of a awful season. Their manager has whisked himself off to Colombia for a jolly, under the guise of having a nose for new talent – a move being sniffed at by his critics. Surrey Police have found an abandoned car in Runtley Wood, thought to belong to the missing Woking manager. The manhunt continues.